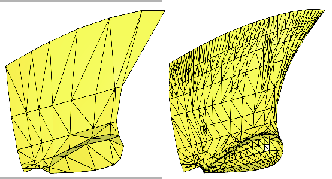 For many numerical calculations a given geometry is discretized using a mesh generation algorithm. In my master thesis I developed a new full or semi automatic algorithm using unstructured mesh generation techniques. 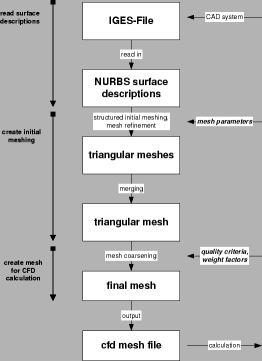 Quality control functions are used to ensure high quality meshes. Please read on for more detailed information about the algorithm developed. Today the ship industry operates in a highly competitive market. low manufacturing costs are important assets in acquiring contracts. 80 % of the labor time needed for a potential flow calculation. engineer easy to use options for global and local mesh modifications. element edges to the NURBS surfaces. by the corner points of the elements on all surface patches. knowledge about the topologic relations between the patches. certain meshes, doesn’t give the results expected for others. analysis as well as making the algorithm numerically more robust. boundaries and knuckles are preserved. All triangular elements should be as equilateral as possible. The area ratio of neighboring panels should be close to unity. local modifications of the element size. also to meshes for highly accurate predictions. Master’s thesis, Universitaet Rostock, 2002. T. Dey and S. Goswami. Tight cocone: a water tight surface reconstructor. Technical report, The Ohio State University, 2002. Technical report, Universitaet Tuebingen, 1998.